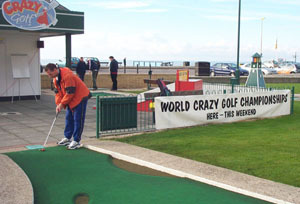 With the croquet season over, I swapped my mallet for a putter and headed to the World Crazy Golf Championships. Three hours of practice at the minigolf in Tynemouth and and I was ready to do battle in Hastings. Competitors all had to play with standard course golf balls. This allowed beginners such as myself to compete without being intimidated by the usual minigolf putters and specialist dimple-free balls that would usually be used in such competition. In fact the top European players will take around 100 different balls to a tournament, some that bounce more than others. Balls of different sizes and textures. 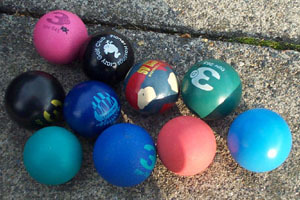 Balls that are suitable for different weather conditions and temperatures. Balls that can have various spins imparted on them by the rubber face of the putter. But for this event, players turned up early on the Friday in the hope of being able to select a reasonably round ball. At practice I set out to get some advice from the defending champion, and Planet Hastings Crazy Golf Club member, Tim "Ace Man" Davies. 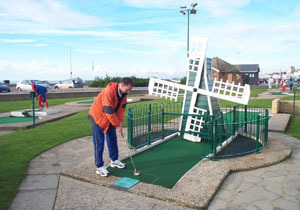 A few tips on the best way to deal with some of the obstacles on the crazy golf were to prove invaluable, although I managed to find a good line around the obelisk. Tim jotted this down in his notebook to make use of later in the tournament, when his trademark growl would accompany yet another Ace. The notebook is a crucial piece of equipment to the serious crazy golfer. Those flat-looking greens are anything but, and having a little map showing the subtle contours of each hole can make all the difference. Moving on to the minigolf this advantage became even clearer. The superbly maintained course on the Hastings seafront certainly takes some getting used to. 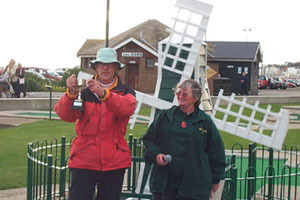 On the Saturday each competitor played two rounds of crazy golf and two rounds of minigolf. England minigolf international Brad Shepherd, fresh from competing in the World Conkers Championship, hit a course record 32 in round one. But Davies then quickly stamped his authority on the competition, producing three rounds of 33 and a 34. Personally, I felt a little more practice may have been useful, as my rounds of 42, 47, 39 and 47 left me well down the field. There remained just one round of each course on the Sunday before the top 12 players from the 50-strong field made the cut for the Final. Finally I came good; a one-under-par 35 on the crazy golf was followed by a 39 on the minigolf, but this left me just one stroke adrift of the two-way play-off for a place in the top 12. In fact I finished 15th, level with 9-year-old Czech Olivia Prokopova, who had taken 3rd place last year. In the final round players were in groups of three, and all three balls were in play at the same time. This meant opponents could be blocked, and or knocked away. A shame then that we never discovered whether the skills of the Irish Golf Croquet Open Champion could have been transferred successfully to that arena. In the end it was Tim Davies who lifted the trophy and pocketed the £500, his winning margin over runner-up Ted McIver a remarkable 13 strokes. And I returned to the north-east knowing that I'd need a lot of improvement to have any chance of winning the 20 pence first prize in the following month's "Albert Steptoe Memorial Trophy".